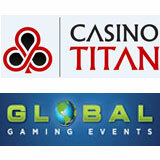 Global Gaming Events is presenting another massive $5,000 casino freeroll tournament, this time at Casino Titan. The online slots tournament will be held first weekend of March 2012. The tournament formats will be a 10 minute 5,000 Starting Chip Slot Tournaments and will have a maximum of 1000 players. Each player will have one 10 minute period to accumulate chips over the course of the designated 24 hour period. This event runs on Saturday, March 3rd, 2012 3pm ET to Sunday, March 4th, 2012 3pm ET. All players who have made at least one deposit or reload of a minimum of $50 during the month of February 2012 are eligible to play. Players must also pre-register for the event with Global Gaming Events to be eligible. Players pre-register for free at Global Gaming Events (http://www.globalgamingevents.com) and play for free – no buy in is required. Registration is a must for all players who want to play.